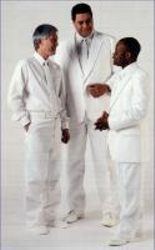 Add your own captions to "Men in White" in the text box below. Guy on Left: So has the church processed your letter of resignation yet? Guy in the Middle: Nope. I figured they would have gotten around to it before I died. Guy on Left: So how can we stop those Mormons from doing temple work for us? Guy in the Middle: I haven't a clue but it is getting pretty annoying. Guy on Left: So your garments didn't protect you from harm either? Whitey #1: Uh, howd you get in here boy? Cursed of Cain: Excuse me? Guy on Left: Doesn't it bother what Brigham Young said about Africans? Guy in the Middle: Yeah, if I was black there is no way I would have joined the Mormon church. Middle Dude: You know, this kind of thing (the meeting of these three) would never have happened even 30 years ago! Guy on right: Yeah. I'm what you call 'Mr. Dark Chocolate', don't you know? Guy on the left: Everything is so white we must be in heaven! Guy in the middle: Yes, it is just as I had imagined. (Ammon, guy on left: Ummm, you know your not supposed to be here, dont you. What kind of place would this be if we let you colored folk in? (center): Relax, Ammon...He is our eternal servent, just like good ol' Joe said! Guy in the middle: "This guy says he is looking for someone name Moroni. Do you know what he's talking about?" Guy on the left "So you're Abel?" Guy in the middle "But I thought God gave Cain the curse of black skin?"